My kiddos’ costumes are ready for Halloween and we are finalizing our spook-tacular decorations for our visiting trick-or-treaters. This year my family will kick off the night with a Halloween craft activity at home followed by a healthy dinner, including these cute clementine and green-bean jack-o-lanterns, and ghostly banana pops before they venture out for the evening. After all, Halloween is about a ghoulish night of fun, it’s not ALL about the candy. 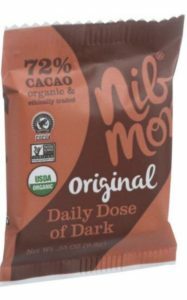 NibMor Daily Dose of Dark Chocolates: Perfectly portioned at just 50 calories per serving and absolutely delicious. This isn’t just a Halloween indulgence. One little package of this stress-busting, good-for-your-blood vessels dark chocolate is something you can feel good about incorporating into your own daily diet as well as giving to your own kiddos. They are organic, non-GMO, gluten-free, vegan, and fair trade-what’s not to love about that? Justin’s Mini Peanut Butter Cups: Justin’s has taken one of my favorite candy treats and made a better-for-you alternative with just 60 calories per piece. These peanut butter cups are available in milk or dark chocolate and are 100% organic and gluten free. UNREAL has reinvented America’s favorite candy. Using the finest quality ingredients from around the world to create candy that is better in taste and nutrition. 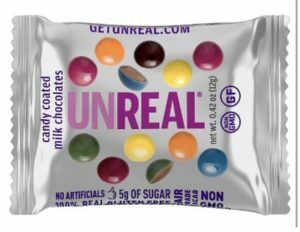 UNREAL products are free of GMOs, gluten, soy, corn, excess sugar and artificial flavors, dyes and preservatives. Surf Sweets has reinvented my daughter’s favorite sour gummy treats by replacing the artificial dyes and sweeteners with organic fruit juice and sweeteners. I feel better, knowing these gummies are free of high fructose corn syrup, artificial colors and flavors, and the top ten allergens. I like to have these healthier sweets on hand to trade in with my kids for the candies and powders that are pure sugar and artificial dyes that seem to glow in the dark. Let’s be honest, my kids will probably end the night filled with slightly aching tummies from a little too much sugar, but at least I can feel a little better knowing they incorporated some healthier options.